PROMENADE MOMENTS are ephemerid encounters of people passing by, instants of joy and relax for family and friends. Tourists enjoy the spectacular colours that even the rain cannot delete. Soldiers have become part of the prom’ where children play happily. 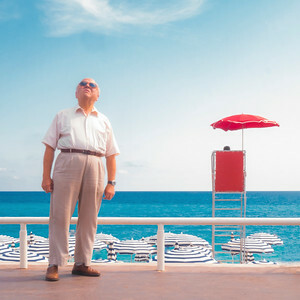 People stop to look into the infinity of the blue sea. Moments and movements surround us in a place where the evil tried to take grip, but the freedom of everyday life full of ease and light prevail. 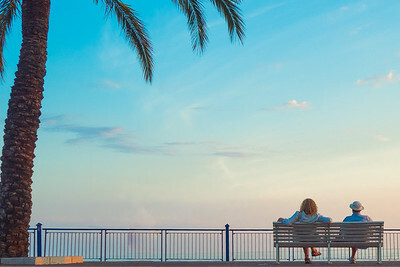 PHOTO OF THE WEEK October 22 - 28, 2017 Image credit © Pia Parolin, as selected by “The Art of Street Photography Gallery” These two ladies sitting on a bench on the Quai des Etats Unis in the city of Nice on the French Riviera enjoy a moment of peace watching the sea. I love the thoughtless relaxed position making you wonder what they are thinking about... (June 2017). THIS PICTURE WAS SELECTED BY THE JURY OF "PHOTOMENTON" AS THE BEST PICTURE OUT OF AROUND 1200 PHOTOGRAPHIES FROM 120 PHOTOGRAPHERS AND IT WON THE "PRIX DE L'AFFICHE", WHICH MEANS IT WILL BE DISPLAYED ON THE POSTER AND BANNERS FOR THE ANNOUNCEMENT OF "PHOTOMENTON 2018" Days with strong winds make the light and colours of the Promenade des Anglais even more intense. The spectacular blue of the sea stands in contrast with the orange on a windy afternoon (September 2017). This lady from Asia was posing for a friend on the Promenade des Anglais and I grabbed the moment she was trying different poses to shoot this picture which is blurred on purpose (September 2017). 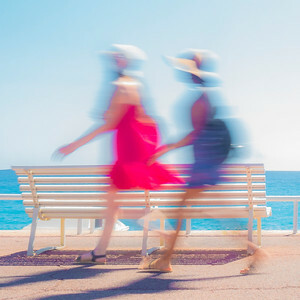 Two ladies dressed in their colourful summer dresses walk past one of the typical white benches on the Promenade des Anglais in Nice (September 2017). Walking along the prom‘ this man stopped to look at the beautiful classic hotel buildings across the street, next to the red life guard post on the beach (July 2017). Skateboarding in the warm evening light, this girl outcompetes the boys with her artistic sport skills (October 2017). 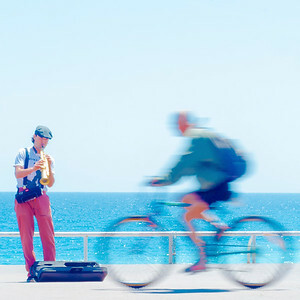 A musician plays his clarinette on a sunny afternoon creating a wonderful atmosphere to which many people stop while others just go past... ​(June 2017). 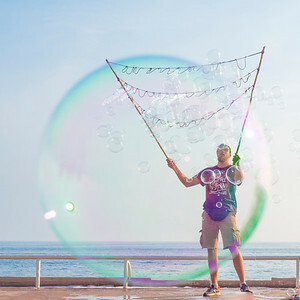 Two young men from Poland traveling through Europe make their money with huge bubbles on the Promenade des Anglais in Nice. They exhibited their art happily when they saw I had a camera with a tripod and I gave them some money. 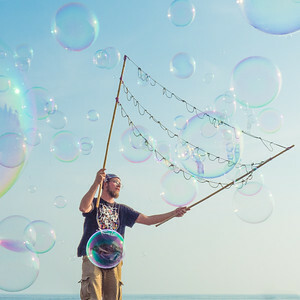 I was happy to capture the instant when a bubble made a frame around the young man (September 2017). Some people sit and watch the sea, others pass by, they cross for an ephemerid moment without taking notice of each other, very common situations on the Promenade des Anglais in Nice, France (September 2017). This lady walked along the prom' with her man on a windy day and the red dress played in the wind making a nice contrast with the blue of the sea (September 2017). 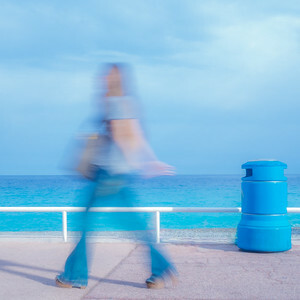 The blue bins are common objects on the Promenade des Anglais in Nice towards the airport. Their colour mixes up with the blue ocean and blue sky. 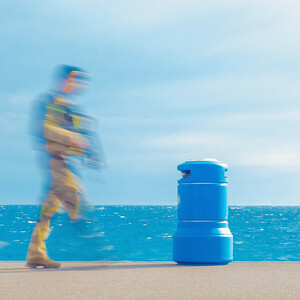 Soldiers pass by at irregular intervals after the murder attacks in July 2016 and have become part of the prom’ scenery (September 2017). Among the many tourists, Chinese are very frequent now on the prom’. This lady protected herself from the sun with her umbrella (September 2017) . Traveling through Europe, this guy from Poland found an entertaining way to make some money for his trip. 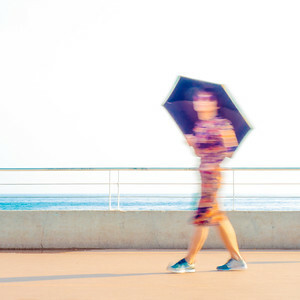 The photo series "Promenade Moments" was created in 2017. Since 2005 I live in the hinterland of Nice on the Côte d'Azur, in southern France. 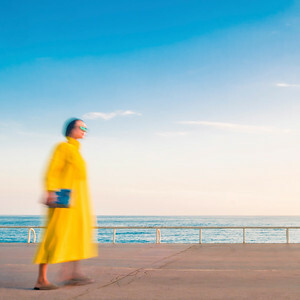 I like to spend my free time with my camera, among others on the Promenade des Anglais, with the sea and the sun and the hustle and bustle - a successful antidepressant in a difficult moment of life. On the evening of the terrorist attack on the 14 July 2016, my children were in Nice for the fireworks and had to spend the night in the house of friendly unknown people. I could not bring them home until the following day. But how many others did not have this luck! I want to share the happiness I was able to recover. The result are these colorful, positive, happy pictures, these moments on the promenade full of life and light. I make photographic workshops with traumatized adolescents and donate large prints to the victims and their families. 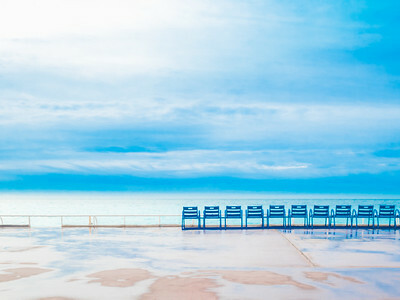 With my "Promenade Moments" series from 2017 on the Promenade des Anglais in Nice, I want to give back some colour and light to the victims of the 2016 terrorist attack by donating metal prints of my pictures to the associations (Promenade des Anges; Hospital Lenval; Habitat & Humanisme). I took these pictures with an Olympus E-M5 II, with a tripod and A cable remote control (settings usually 1/6 - 1/10 sec at aperture 22, focal length 60mm, ISO 200, no flash, no filter). 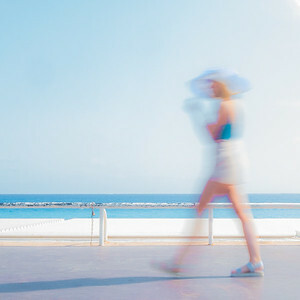 The long exposure time and the high luminosity of the Côte d'Azur lead to overexposed images that were subsequently compensated with Lightroom CC. Overall, my basic idea is to make the image in its final form directly with the camera. So I limited the post-processing on the computer to a minimum. No picture is artificially composed, cut or reassembled. The movement was captured directly with the camera through the extreme settings. They're all natural, non-posed photographs of people on the promenade. 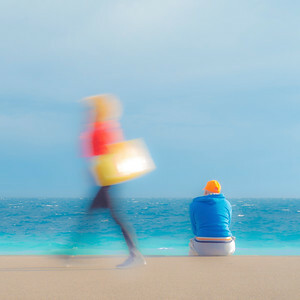 I had my first photographic exhibition - with this series "Promenade Moments" - in November 2017 in Menton, France, at PhotoMenton 2017, and received ad hoc the first prize ("Prix de l'Affiche") with the picture "The Orange Cap".